If you like any combination of great food, outstanding music, quaint and unique shops, wineries, museums, art galleries, golf, bed and breakfasts, biergardens, hiking or biking then you need to spend a weekend or vacation in Fredericksburg, Texas. This historic Texas gem is located in the Texas Hill Country and is loaded with lots of fun things to see and do within 30 minutes. We've been to Fredericksburg a number of times and each time we find something a little different to experience as well as giving our favorites another go. Our latest trip to Fredericksburg was built around Thomas Michael Riley's 5th Annual Texas Music Festival held in April in Luckenbach, which is just outside Fredericksburg. This festival is three days of outstanding country music held on a small outdoor stage under the oak trees during the day and in the evening the music moves to the famous Luckenbach Dance Hall a few steps from the outdoor stage. This year's line-up included: Hal Ketchum, Tejas Brothers, Roger Creager, Deryl Dodd, Larry Joe Taylor, Randy Brown, Chris Wall, the Wolf Sisters, and, of course, Thomas Michael Riley. Great music, cold beer, good times, and a fun crowd. Read our review of Thomas Michael Riley's 5th Annual Music Festival to learn more about this great annual music event. 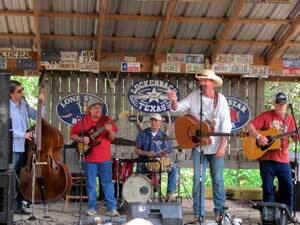 Luckenbach is only 10 miles or so from downtown Fredericksburg and just about every weekend you'll find some type of music festival or live music. 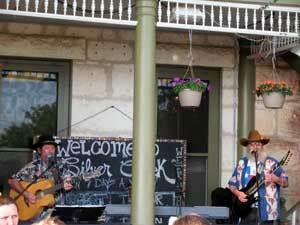 And just visiting Luckenbach and enjoying a cold beer is worth the trip. If you like live music from some very talented local as well as some of the well known musicians, then you'll love Fredericksburg. You'll be hard pressed not to find several choices each weekend - from acoustic on a restaurant patio to polka in the biergarden to a music festival at a winery or some other venue. I'm sending a letter to Governor Rick Perry to nominate Fredericksburg as the "Second Music Capital of Texas" - watch out Austin, Fredericksburg is catching up with you! It's hard to beat sitting on a restaurant's patio or biergarden enjoying the great outdoors, a cold drink, great music, and good food. Fredericksburg is home to over 65 restaurants serving everything from Asian to German (as you might expect in a town founded by German immigrants) to Mexican to Italian and more. Some are gourmet, others are more casual where shorts and tee shirts are in order, and a lot have outdoor patios. A couple that we have enjoyed include: Hondo's with some ok food but typically very good music and Silver Creek which has very good food and ok music. The top rated restaurants that are consistently mentioned as great include: Sunset Grill, Cabernet Grill, Pasta Bella, Auslander, and Der Lindenbaum. And if you've got time and want a scenic drive through the rolling countryside and you're craving a huge greasy half pound outstanding burger (Texas Monthly Magazine listed them as the third best in Texas) then the drive 15 miles outside of town to Alamo Springs Cafe. It is well worth it. And while you're there, why not go for hike or watch over three million Brazilian free-tailed bats and 3,000 Cave myotis head out around sunset in search of food at Old Tunnel State Park & Wild Management Area. The bats took over the abandoned railroad tunnel in 1942 and you can view them from May to October. Fredericksburg is a wine lover's dream - within 45 minutes there are over 30 wineries waiting for you to come out and sample some of their award winning wines. Fredericksburg and the Texas Hill Country is second only to Napa Valley in California in wine production. 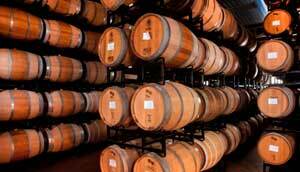 Check out our Wineries Page to find some of the wineries and the wine trails. If you plan on sampling a few wines, why not sign up for a winery tour and let them do the driving - sign up with Texas Wine Tours. After all the good food, cold beer, and tasty wine it's time to get some exercise, so make sure you bring your hiking boots, golf clubs, or bikes. 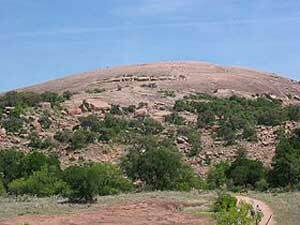 You can spend several hours hiking and enjoying Enchanted Rock which is a huge, pink granite boulder that rises 425 feet above ground, 1825 feet above sea level, and covers 640 acres. It is the second-largest batholith in the United States and 17 miles outside of Fredericksburg. Climbing up and down the Rock, you should be able to burn off 4 German beers, a half bottle of wine, and that delicious dessert. If you ride bikes, the back roads around Fredericksburg are very scenic and there are some good mountain bike trails in the area. 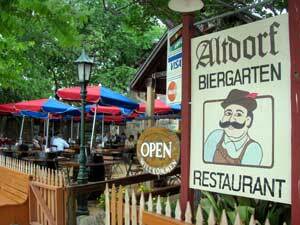 We enjoy parking the car on a back street and riding bikes through Fredericksburg stopping frequently to check out the shops, enjoy a biergarden, and munch on appetizers listening to some good music on a restaurant's patio - won't loose much weight but it's fun! Check out Trails.com maps to help you find a good ride. If you haven't worn off enough calories from any of that and you like golf, why not walk a round of golf at Lady Bird Johnson Golf Course. It's a hilly, fun, and a somewhat demanding course with pretty good conditions and reasonable prices. You can't walk it and you may not be able to play it, but the golf course in the very exclusive and upscale Boot Ranch Golf Community is an excellent private course. 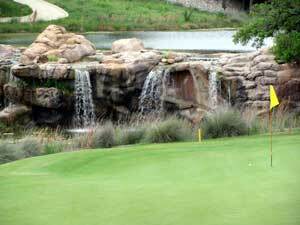 Check out our reviews of Boot Ranch and Lady Bird Johnson Golf Courses. There are several other excellent golf courses within an hour - use this Central Texas Golf Map to help you find a course to play. After all that activity, eating, drinking, and dancing, you'll be ready for a good nights sleep and you have lots of choices for places for a restful night. Fredericksburg has a slew of B&Bs that are walking distance to the shops or restaurants and there are plenty of motels/hotels and some very unique and romantic lodging. 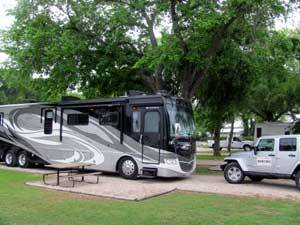 Or you can pitch a tent or hook up the RV in any of several RV parks. 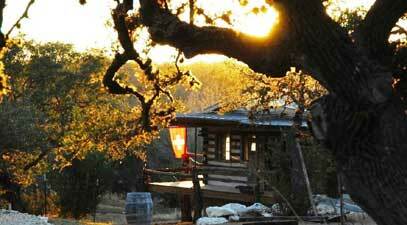 A couple of our favorites include Barons Creekside for some unique cabins/chalets or Fredericksburg KOA for camping. Visit the Fredericksburg Website to find things to do, wineries, lodging, restaurants, events, and lots more. Have fun.